In 1994, Agustina Lagos Marmol, a young and adventurous Argentinian with a passion for skiing traveled from a remote town in the Andes to Southern Tyrol. "I fell in love with these mountains" the now fortysomething Agustina tells me over a glass of wine at the Rosa Alpina, a venerable family-run hotel in San Cassiano, in the heart of the Dolomites. "They reminded me of my Patagonia". She stayed, married, separated and raised a daughter while working as a guide. In the process, she has become a major force behind the "slow skiing" boom in this area. Not to be confused with cross-country skiing, which takes place on relatively flat terrain in a limited area, slow skiing has become synonymous with traveling over great distances (as opposed to going up and down the same mountain like a caged hamster). It is changing the way we think about the sport. 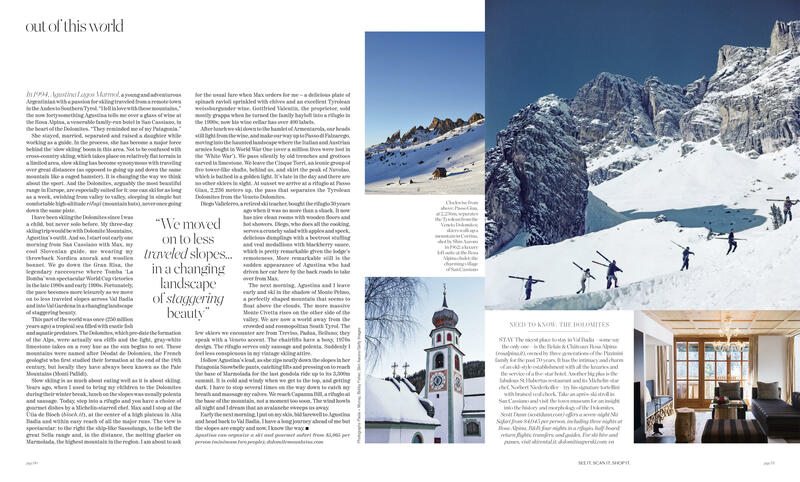 And the Dolomites, arguably the most beautiful range in Europe, are especially suited for it: one can ski for as long as a week, swishing from valley to valley, sleeping in simple but comfortable high-altitude rifugi (mountain huts), never once going down the same piste.